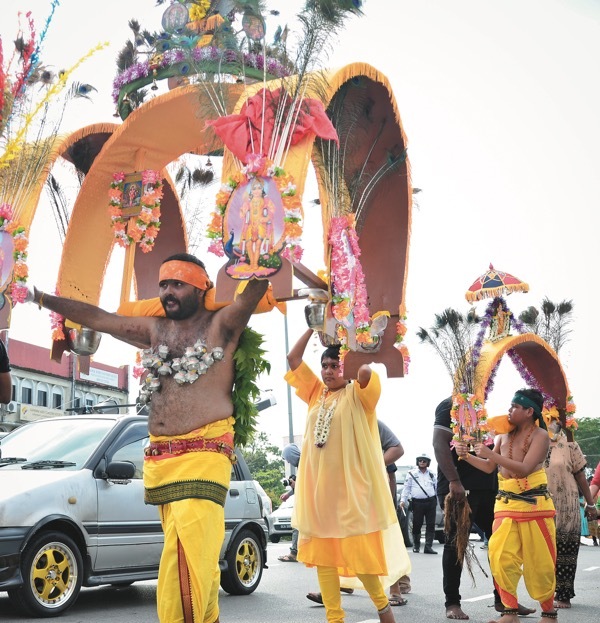 KUCHING: More than a hundred Hindu devotees gathered at Sri Maha Mariamman Temple at Rock Road here yesterday in conjunction with the annual celebration of Thaipusam. Witnessing the celebration were the multiracial public as well as tourists. The celebration started with ‘pooja’ prayers at the temple and thereafter a procession from the temple to their destination, Srinivasagar Kaliamman Temple at Jalan Ban Hock. The procession began at around 9.30am which saw devotees carrying milk pots or ‘paal kudam’ on their heads and also ‘kavadis’ whereby some of the devotees were attached with hooks and spears through their upper bodies, backs and cheeks to fulfil their vows to Lord Murugan. Thaipusam is among the biggest festivals for the Hindus which is held annually based on the full moon day in the month of Thai in the Hindu calendar. Hundreds pay respects to Lord Murugan 0 out of 5 based on 0 ratings. 0 user reviews.